Tyler McBrien is a research associate for education at the Council on Foreign Relations. On January 9, President Jacob Zuma announced the appointment of a long awaited judicial commission of inquiry into allegations of state capture. The phrase, plucked from a 2000 World Bank paper and popularized by a 2016 report by South Africa’s then Public Protector Thuli Madonsela, describes a widespread system of political corruption where the powerful Gupta family influences state decision-making through its close ties with President Zuma and his affiliates. “It is of such serious public concern that any further delay will make the public doubt government’s determination to dismantle all forms of corruption‚ and entrench the public perception that the state has been captured by private interests for nefarious and self-enrichment purposes,” said President Zuma of the allegations in a public statement. Others have reserved celebration, as the announcement came on the heels of a December 14 court order forcing President Zuma to approve such a commission within 30 days. Skeptics also view this as a signature political parry of the “Teflon president,” pointing to the timing of the announcement, which occurred on the eve of a meeting of high-level African National Congress (ANC) officials widely speculated to be debating President Zuma’s recall. The state capture commission, coupled with his free higher education plan revealed last month, demonstrates President Zuma’s particular skill for throwing water on the fire the very moment before he is engulfed in flames. Just like the complex nature of state capture itself, with its dizzying web of corruption propped up by esoteric procurement laws, the devil of Zuma’s commission announcement is in the legal details. In the “commission capital of the world,” debate abounds as to whether or not these costly productions actually achieve what they set out to do. Commission findings often take much longer than anticipated, and the state has no obligation to act on them. Plus, the effectiveness of commissions of inquiry depends upon their terms of reference, or investigative scope. Too narrow, and the commission lacks the authority to investigate widespread wrongdoing. Too broad, and the commission gets bogged down in an excess of information. To reach an effective Goldilocks equilibrium, the terms of reference should draw on the public protector’s recommendations and the suggestions laid out in the impressive work done by researchers and activists in South Africa’s vibrant civil society. 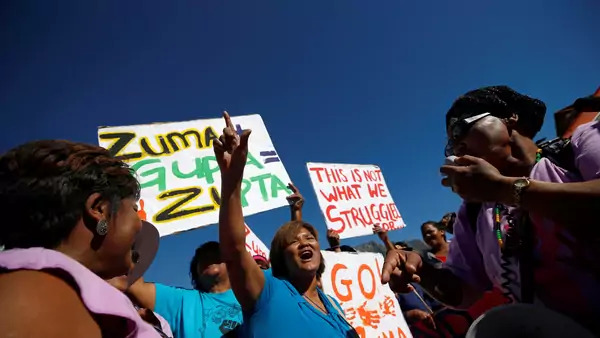 However, with President Zuma’s appeal of last month’s court decision still pending, some have argued that he still retains the ability to set the terms of reference, which he would no doubt set in his favor. This important aspect of the commission has not escaped notice from President Zuma’s enemies. On January 18, members of the Democratic Alliance, one of South Africa’s leading opposition parties, demanded that President Zuma release the terms of reference by Friday and adhere to Public Protector Madonsela’s recommendations, a provision that newly elected ANC President Cyril Ramaphosa has also endorsed. In the likely event that this commission of inquiry into state capture falls victim to the shortfalls of commissions past, the recent announcement will prove to be just one more deft move in President Zuma’s political dance of survival.